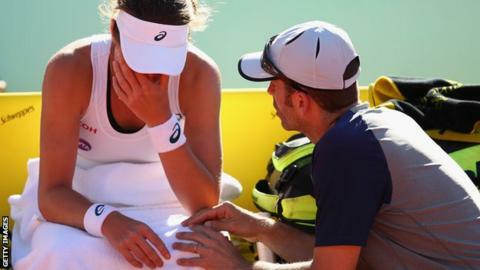 British number one Johanna Konta retired from the Madrid Open with an upper respiratory illness. The 24-year-old Australian Open semi-finalist was trailing 6-4 2-1 in her first-round match against Caroline Garcia of France, the world number 51. Fit-again Briton Laura Robson suffered a 6-4 6-2 first-round defeat by fourth seed Victoria Azarenka of Belarus. Heather Watson could not capitalise on a lucky loser place as she lost 7-5 6-4 to Australia's Daria Gavrilova. Former British number one Robson missed 17 months with a wrist injury, and has won just one WTA main draw match since returning last summer. The 22-year-old, using her protected ranking of 58 to enter, saved five match points but lost in 84 minutes to the world number five. She lost a keenly contested opening set in 40 minutes against Azarenka, the two-time Australian Open champion, who is ranked fifth in the world after winning the titles in Indian Wells and Miami this year. But in the first meeting between the pair, Azarenka raced 4-0 ahead in the second after winning six games in succession and soon recorded her 25th victory in 26 matches this year. Watson, 23, lost to Croatia's Mirjana Lucic-Baroni in qualifying on Saturday but went through as a lucky loser after illness forced out Yulia Putintseva. However, the Briton was beaten 7-5 6-4 by 22-year-old Gavrilova, the world number 39. British number three Naomi Broady lost 3-6 6-3 6-3 to Monica Puig in the final round of qualifying on Saturday.